Thank you for considering me as a loving parent for your child. I will not pretend that I know what you are going through. I can only imagine the roller coaster of emotions you must be feeling. All I can do is share a little piece of me with you here and in my profile, hope it gives you insight to who I am and maybe it can help make your difficult decision a little easier. I admire your bravery and courage and I have the utmost respect and admiration for you in choosing this path.. I have prayed for my own family for many years and I trust in God's plan. My niece, Kate, wanted a clown birthday party so my mom and I dressed the part! Baking themed cakes with my nieces and nephews every holiday. I love all music, but my favorite is definitely country. My favorite food is Tex-Mex and my favorite dessert is a warm chocolate chip cookie topped with vanilla ice cream. After every first day of school we get together for root beer floats and each kids gets to tell us all about their first day! Christmas Eve is a full day that starts with breakfast and holiday movies, then Mass, game night and we all spend the night at my brother's house. Annual Fourth of July fireworks with a big group of family and friends at our local club. On Easter we go to mass and then we have a family egg hunt, and a confetti egg fight with friends. Two of my nieces and I on our way to Chicago for the weekend. Our surprised smiles showed the relief we made the flight after we rushed to the airport after their last finals of the school year. I also love when our relatives come to visit us in Texas! This is just some of us during the visit. Playing the Pie Face game with the family on Christmas Eve. Going into the Garth Brooks concert with my family and best friends. I surprised my friends with a visit from Santa at my annual ornament and fundraising Christmas party. Vacation in Gulf Shores with my brother and his family. Horseback riding in the Colorado mountains with friends. My nephew's first time at a Packers game! A little pre game fun with my niece, Maddie, and family in Green Bay! 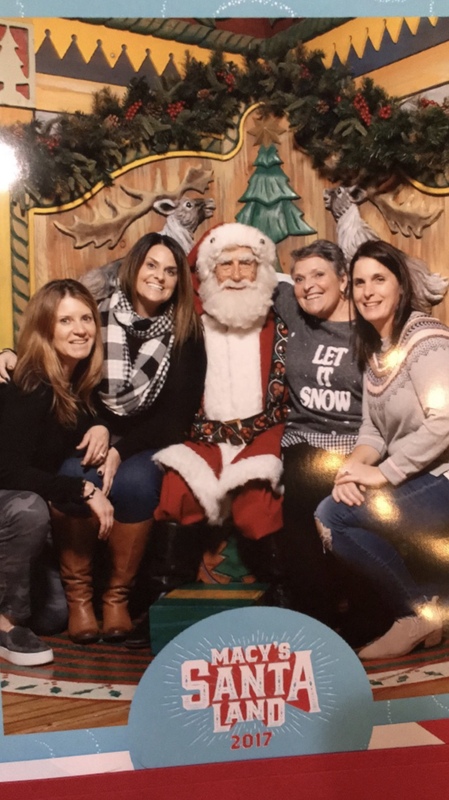 A fun girls weekend in New York City at Christmas time with my mom, sister in law and my best friend. We had to go see Santa at Macy's! Celebrating New Year's Eve in New York City. We got to see the ball drop in Times Square! I surprised my sister in law and niece and nephew with Texas Rangers Play off tickets. Celebrating the first day of school with root beer floats my nieces and nephews while they shared their favorite part of their day. Family and friends before our annual Turkey Trot run in our neighborhood. Even Brodie made the 3 mile trot before we filled our bellies the rest of the day! Meeting my cousin's baby boy for the first time! Thank you so much for taking the time to learn a little about me. Nothing is more important to me than being the best parent to your child. I promise you that I will always put the needs of your child first, protect them with my life, surround them with loving and honest people, love them unconditionally, provide them with the best education, and always be there on their worst days, celebrate with them on their best days and they will always know they are loved by you and me.